There's really only way to take immediate productive action to protect your household, and that is to lock-in today's prices by purchasing foods that store indefinitely. How about some good news? For a short duration, we are able to offer excellent sale prices on different Future Essentials foods (including dog food, for you pet owners)! Shop today to ensure best selection and prompt delivery. Buy any 4 Future Essentials cases in a transaction and receive a $25 gift certificate, Buy 8 Future Essentials cases and get a $50 gift certificate. Gift certificates will be sent you via email and will be applicable for all future purchases, one time use, no expiry date. Remember this classic? The perfect blend of salt and sweet - loaded with calories! This will be a favorite if the lights go out OR on the trail. No food plan is complete without a delicious snack like this!!. Each Can contains 5 pounds of the finest Lentils we could buy. Packed in a number 10 Can, they are 100% US Procured and Produced and canned in the last 30 days. Each can is sealed in an oxygen and moisture free environment. This listing is for a full case of six #10 cans, each can weighing 5 lbs. of the finest Triple Cleaned Pinto Beans we could buy. They are 100% US procured, produced and canned in the last 30 days. Check out all Future Essentials Products here..
We look for ways to give you the best products and best prices. We bring you Yoder's line of product. These are very popular and a great addition to your prep and outdoors needs. And you can buy case or cans. As always members save extra. Here's what our customers think about Yoders. 12 Cans per case, 40 to 50 slices per can. 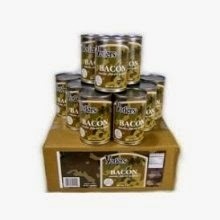 Each can is 9 ounces of fully cooked and drained bacon. Between 2-3/4 and 3-1/4 pounds of raw bacon go into each can. Each can is the highest quality fresh #1 bacon slices. Cured to specifications, cooked and then hand wrapped, rolled and packed in the U.S.
21 Pounds of Yoder's Canned Meats TOTAL!